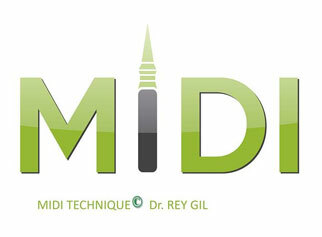 MIDI Technique, a revolution in Implantology. Dr Darío Castro is the only MIDI specialist in the Canary Islands. What are the flap-less Implants? Not long time ago, even at the present time, before placing a dental implant, the surgeon has to cut and raise the gum, drill the bone with special burs, place the implant and finally suture the gum. Swiss’ Implants ROOTT are specially designed to be placed straight to the bone through the gum, without using a surgical blade and without stitches as well. Because of it´s innovative and unique design, this Implant can be placed on the ordinary way ( raising a gum flap and giving stitches afterwards). Midi is a revolution in dental Implantology. Basically, the technique consists in placing the Implant in the upper Maxilla without raising a flap and without giving stitches of any kind. Usually, in order to place an implant, we drill the bone with different tapered burs or drills and after it, place the dental implant. It means making a hole in the bone, erasing that bone area and hurt it as well. It´s the common technique around the world in Implantology. With the new MIDI implant Technique, its not necessary erase and traumatise the bone. The difference consists on placing some bone dilators that compress the bone but erasing and hurting it. Those dilators are the pathway to the self-screwing Tapered Dental Implant ( with a rootform). The Implant can penetrate and widen the bone without hurting it. Which one´s are the best implantst for he MIDI Technique? An adequate Implant design its an important factor added to the technique. The ideal implant is a rootform Implant, tapered and self-screwed. It penetrates the bone compressing, dilating, and widening it. Those implants are ROOTT Implant System from Bache, Switzeland (TRATE AG), designed by the Engineer Sergey Shulezhko.